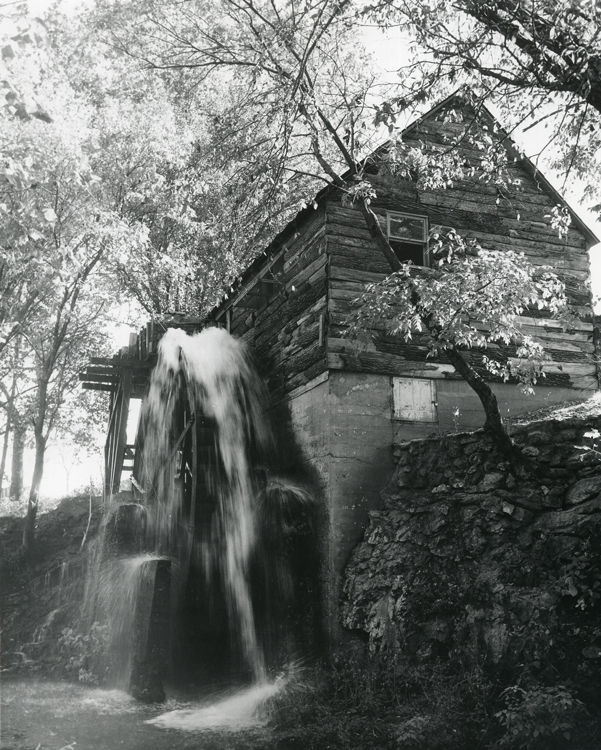 (19510, Oklahoma Historical Society Photograph Collection, OHS). Located in northeastern Oklahoma, Adair County is bounded on the east by the state of Arkansas. Cherokee County borders Adair to the west, to the north is Delaware County, and to the south is Sequoyah County. The county's major highways are U.S. Highway 62, an east-west route, and U.S. Highway 59, a north-south road. Other east-west routes include State Highways 51 and 100. Adair County has 577.03 square miles of land and water. The region is part of the Ozark Plateau uplift, which comprises the tree-covered foothills of the Boston Mountains. The north and central portions of Adair County are drained by the Illinois River and by Barren Fork, Evansville, and Caney creeks. Near Stilwell are Sallisaw and Little Lee creeks. Prehistoric Adair County was inhabited by Archaic and Woodland peoples. Later the Caddoan and Osage peoples lived in the present county. The first whites to arrive in the region were Creole trapper-traders, and after 1812 white pioneers pushed into the area. In 1825 the Osage sold the land that is now Adair County to the United States. As early as 1828 the Western Cherokee arrived from Arkansas. In the 1830s the Eastern Cherokee appeared, this time from Georgia, Tennessee, and North Carolina. By the turn of the twentieth century whites outnumbered Cherokees in their nation, and by 1910 whites doubled American Indians in the county. Demographics changed even more over time, and in 2000 there were 8,938 American Indians, 10,207 whites, 38 African Americans, and 20 Asians. At the Oklahoma Constitutional Convention in 1906 Adair County was created from the Going Snake and Flint districts of the Cherokee Nation. The county received its name from the influential mixed-blood Cherokee Adair family. In 1901, anticipating Oklahoma's upcoming statehood, the battle for the county seat began when the Stilwell Standard stated that its town would be the seat. Westville also declared its intent to host the government offices. The state's constitutional convention delegates selected Westville. In 1908 the battle began again. In an election on June 2, 1908, Stilwell won by 101 votes, but the Westville newspaper protested. A referee, Judge De Ross Baily, reported Westville as the permanent location. The Oklahoma Supreme Court rejected his report. Stilwell also won the second election. Then in the third election, in 1910, Stilwell won by a mere thirty votes. Westville protested again. The second referee, O. J. Hubbel, found no fault with the election, and Gov. Charles Nathaniel Haskell made the decision that Stilwell would remain the seat of government. Two railroads have served the area. In 1895–96 E. L. Martin and Arthur E. Stilwell brought the Kansas City Southern Railway Company to Adair County. The line passed through Watts, Westville, and Stilwell, helping to boost the communities' economies. On January 29, 1962, the Kansas City Southern Railway merged with Kansas City Industries. From 1901 to 1903 Charles N. Haskell and William Kenefick constructed another line through the area. The purpose of their Ozark and Cherokee Central Railroad was to carry produce to market. In July 1942 crews began dismantling the line. Agriculture has been a key to the economy. In 1907 county farmers planted 16,299 acres of corn, 4,883 acres of wheat, 2,257 acres of oats, and 1,213 acres of cotton. By 1934 corn still dominated, with 4,173 acres planted, followed by wheat (4,173) and oats (2,740). By 1959 the main crop was sorghums (6,200 acres), with oats (2,100) and corn (2,300) the other principal products. In 2000 wheat led with 2,000 acres planted, and 35,000 acres of hay was harvested. Cattle raising assumed increasing importance over the twentieth century. In 1907, 4,799 cattle and 1,691 horses were on hand. By 1935 there were 14,908 head of cattle. In 1960 and 1961 farmers began to convert large amounts of land to dairy and livestock pastures. In 1961 the number of cattle increased to 26,000 and by 2000 stood at 55,000 head. Other economic developments affected the county. In 1942 Stilwell Canning Company (after 1974 Stilwell Foods) opened, providing employment. Nonetheless, in 1960 Adair County reported the lowest per capita income in Oklahoma. In the 1960s citizens began to promote tourism and economic development. In 1974 Baldor Electric built a factory in Westville, manufacturing electric motors. Numerous historic sites are located in the county. Fort Wayne, constructed in 1838, was moved to present Delaware County in 1840. The site was abandoned from 1842 until 1862 when a Civil War battle occurred there. Adair County was also known to bandits and outlaws such as the Starrs, the James brothers, and Charles Arthur "Pretty Boy" Floyd. Local sites listed in the National Register of Historic Places include the Adair County Courthouse (NR 84002927) in Stilwell, Golda's Mill (NR 72001049) near Stilwell, and the Buffington Hotel (NR 84002929) and Opera Block (NR 84002934) in Westville. Adair State Park is located near Stilwell. Adair County also hosts the annual Strawberry Festival at Stilwell. In this predominantly rural county the population has remained small. In 1910 the census counted a total of 10,535 residents. In 1930 the population had risen to 14,756. In the 1940s, 15,755 people lived in the county, and then the number began to decline. By 1960 it stood at 13,112. In the 1970s it began to rise, peaking in 1980 at 18,575 before dropping to 18,421 in 1990. In 2000 the census counted 21,038 and in 2010, 22,683, of whom 43.3 were American Indian, 43.0 percent white, 0.6 Asian, and 0.2 percent African American. Hispanic ethnicity was identified as 5.3 percent. The incorporated towns were Stilwell, Watts, and Westville. Noteworthy residents have included Ned Christie (1852–92), a controversial figure sometimes labeled an outlaw. Likewise, Ezekial Proctor (d. 1907) was an alleged outlaw charged with killing an Indian woman. He was acquitted by the Cherokee courts, but he never passed through the U.S. legal system. Contemporary figures include former Speaker of the Oklahoma House of Representatives Larry Adair (1946– ), a Stilwell native. Adair County was also the home to Wilma Mankiller (1945–2010), the first woman to be principal chief of the Cherokees. Another local personality was Sam Claphan (1956–2001), who played football for Stilwell High School, for the University of Oklahoma, and for the San Diego Chargers. History of Adair County: Including Flint and Goingsnake Districts (Cane Hill, Ark. : ARC Press, 1991). Lucy Jane Makoske, Adair County, History, and Legend (Stilwell, Okla.: Stilwell Chamber of Commerce, 1969). Westville, I.T. : The Gate City to Indian Territory, Valuable Information About a New Town in a New Country (; reprint, N.p. : Goingsnake District Heritage Association, 1988). Rachel Whitaker, "Adair County," The Encyclopedia of Oklahoma History and Culture, https://www.okhistory.org/publications/enc/entry.php?entry=AD003.